Alreadyday 3 in our new home! I’m impressed how quickly the team adapted to this alienenvironment, with the beautiful coral reef and marine life outside the window,the omnipresent and complex life support systems of Aquarius, the odd feelingof distance from people living on the surface… all of these make it feel likewe’re in another world! I think that sharedexperience has made us quickly comfortable living here with each other. Wereally function like a team, meaning we don’t think about our life and worktogether as “teamwork”, but rather as spontaneous, easygoing and friendlyinteraction. When people are genuinely happy to work together, teamwork justhappens, it’s the natural way people like to help others and work towards acommon goal. Everything here isteamwork. 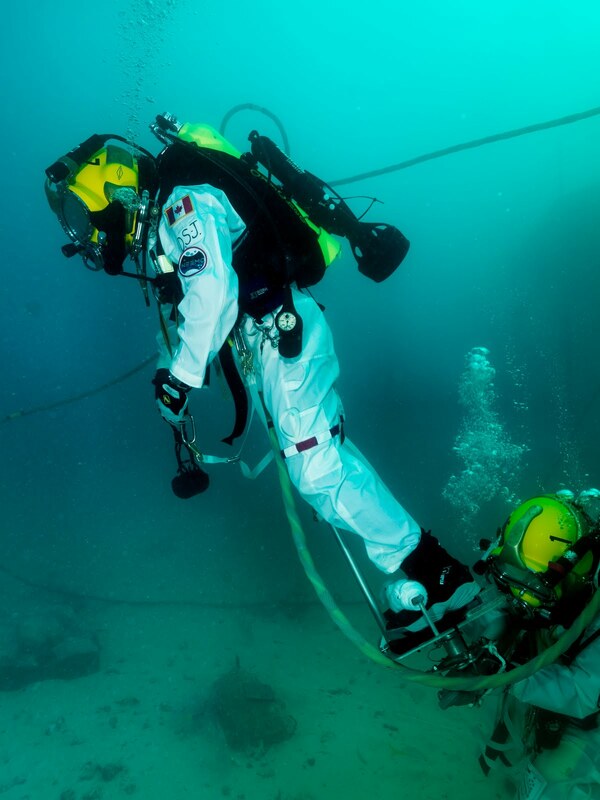 During our mock spacewalks it’s most obvious: the outside crew,inside crew, habitat technicians, safety divers, mission controllers andCapComs, scientists, engineers, public affairs personnel, all fluidly workingtogether. But teamwork is also omnipresent in daily life in Aquarius, in themeal preparation, in the care for common areas, in the way we generally lookout for each other. Our families arealso part of the team! Today instead of the usual dehydrated hiking food, weate a meal prepared by my wife and sent down to Aquarius with the dailysupplies delivery. A nice morale boost! Teamwork isessential if we want to achieve something bigger than ourselves – and it’s fun,too! You wrote “all of these make it feel like we’re in another world!”. Well, you ARE in another world! I’m a 51-year-old Canadian, and I can’t help but reminisce the first Cousteau series on Canadian television, “L’Odyssée sous-marine du Commandant Cousteau”. So little was known back then about the underwater worlds, their’s was really an exploration in another world!